Women In The Music Industry Call For 'Evolution' At The Grammys : The Record Artists and music executives are calling for the Recording Academy to diversify its voting ranks. One big hurdle: No one knows how many women are even members of the organization. 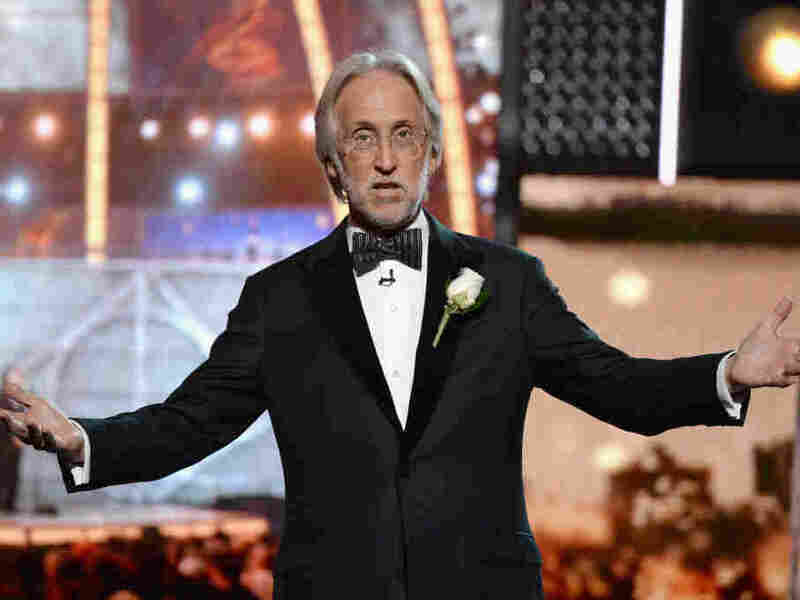 Recording Academy and MusiCares president and CEO Neil Portnow, onstage during the Grammy Awards at Madison Square Garden on Jan. 28 in New York City. Top solo artists and groups of high-powered female executives in the music industry are demanding change within the Recording Academy. Much of that momentum has built up over the past week, since the telecast of this year's Grammy Awards ceremony, which were held Jan. 28 at Madison Square Garden. The outcry is a direct response to the the format and content of this year's telecast, and to statements made by the highest-ranked official at the Recording Academy — the professional organization whose members vote for the Grammys — and the producer of the telecast. Among those who have spoken out are musicians including Pink, Fiona Apple, India.Arie, Sheryl Crow, Vanessa Carlton, Charli XCX and Kelly Clarkson, as well as two groups of highly influential, female industry executives. Many of those women are calling for fundamental changes to the way that the Recording Academy (also known as NARAS, or the National Academy of Recording Arts and Sciences) is run, and for a change in the organization's leadership. NARAS has responded with plans to address issues of gender bias. However, NPR has learned that the group does not know current demographic details about its membership. In the run-up to this year's Grammy ceremony, there was a great deal of public speculation about whether or not the Academy would address #MeToo and #TimesUp with the same coordination and effect that Hollywood did at this year's Golden Globes — in what Meryl Streep memorably called a "thick black line." The Recording Academy may have expected that the evening would be a victory lap, a 60th anniversary celebration of the industry's own successes. With a provocative opening performance by Kendrick Lamar and a segment dedicated to #MeToo and #TimesUp, it's entirely possible that the ceremony's organizers felt that they were ticking all the right boxes for 2018. Over the course of the three-and-a-half hour telecast, only one solo female musician accepted an award on screen: Alessia Cara, who was awarded Best New Artist. Conversations about gender equality and alleged sexual misconduct were, aside from the white roses pinned to the lapels and dresses of many attendees, mostly shoehorned into a single segment of the televised ceremony. It began with a fiery introduction from singer and actress Janelle Monae, who declared: "We come in peace, but we mean business. And to those of you who would dare try and silence us, we offer you two words: Time's up." What followed was an anthemic performance of "Praying" led by Kesha, who was joined by Cyndi Lauper, Camila Cabello, Bebe Rexha, Julia Michels, Andra Day and the Resistance Revival Chorus. And then, it was back to Bono. A number of high-profile allegations of sexual assault or misconduct have emerged from the recording industry, and many female musicians have added their stories to the #MeToo movement. But those accusations haven't reverberated as widely, or had such earth-shaking repercussions as similar allegations have had in Hollywood, for example. NARAS has no jurisdiction over the wider music industry, but it is perhaps the closest approximation of a confederation of recording industry professionals; it's both a banner-carrier and a microcosm of the larger business. And in the week that has followed the Grammy Awards, fans, artists and other women in the music industry have made public their frustration with The Recording Academy. The blowback began to build after audiences noted that the singer Lorde — the sole woman nominated for the Album of the Year prize — did not perform on the telecast. Immediately following the awards ceremony, the trade publication Variety asked both the Recording Academy's president and CEO, Neil Portnow, and the telecast's producer, Ken Ehrlich, about Lorde's absence. Ehrlich argued to Variety that there just wasn't time to include Lorde as a solo performer. "These shows are a matter of choices," Ehrlich said. "We have a box and it gets full," he said, adding, "There's no way we can really deal with everybody." Portnow has headed the Recording Academy since 2002; he replaced Michael Greene, who was forced to resign from NARAS after allegations that he sexually harassed and abused another Academy executive surfaced. (According to The New York Times, NARAS trustees reportedly paid the woman who accused him a $650,000 settlement, and then hired a private investigator to examine Greene's behavior with female colleagues.) Around the same time, the Los Angeles Times also ran an investigative series examining the Recording Academy's finances, and asserted that NARAS' charitable arm, MusiCares, spent less than 10 percent of its fund-raised income on assisting artists. Portnow — who sported a #TimesUp white rose in his lapel during this year's telecast — made comments to Variety that proved perhaps even more infuriating to many women. "It has to begin with ... women who have the creativity in their hearts and souls, who want to be musicians, who want to be engineers, producers, and want to be part of the industry on the executive level," he said. And in a phrase that became infamous immediately, Portnow added that women need "to step up because I think they would be welcome." Some prominent female musicians, like nine-time Grammy winner Sheryl Crow, three-time winner Kelly Clarkson and Charli XCX, have used social media to communicate their feelings. On Jan. 30, Pink, another three-time Grammy winner who performed her ballad "Wild Hearts Can't Be Broken" on this year's telecast, posted a note on Twitter that spoke directly to Portnow's "step up" comment, without addressing Portnow himself. "Women in music don't need to 'step up,'" she wrote. "Women have been stepping since the beginning of time. Stepping up, and also stepping aside." On Wednesday, Portnow tried to walk back his comment in another statement to Variety. He claimed that the "step up" remark was taken out of context, and did not quote "convey my beliefs and the point I was trying to make." Portnow declined requests for comment by NPR, but in a statement sent to NPR and other media outlets last Thursday, he announced that the Recording Academy is setting up an independent task force to "review every aspect of what we do as an organization, and identify where we can do more to overcome the explicit barriers and unconscious biases that impede female advancement in the music community." My experience may not be terribly unique: A common stereotype is that the majority of Academy voters — some 12,000 people in all — are older, white men. In terms of actual statistics, it's not at all clear who the Grammy voters are, or how their demographic information may (or may not) incline them to vote. As a former voter, I don't recall ever having been asked about my gender, age or race. So in the course of pursuing commentary from Portnow, I asked the Recording Academy if the organization had any demographic statistics about its membership. Through a spokesperson, the Recording Academy said that NARAS has incomplete information demographic about its membership; it asks its members for that data, but does not require them to provide it. And so NARAS' leadership simply doesn't know the makeup of its existing membership — which will may prove to be a significant hurdle in the kinds of improvements that Portnow is pledging to make. Through a representative, Lorde declined to comment directly to NPR about her absence from the Madison Square Garden stage. On the night of the ceremony, however, she posted to Instagram a photo of a quotation from artist Jenny Holzer that she had sewn to the back of her dress, which Lorde called her "version of a white rose." In the aftermath of Portnow's comments, some prominent female artists and industry figures have condemned him. Some are explicitly calling for Portnow to step down altogether, including singer-songwriter Vanessa Carlton, who has been nominated for three Grammy Awards, and who performed on the 2003 awards telecast. Carlton has been instrumental in publicizing a petition calling for Portnow's resignation. It is not clear if those who have signed the petition, which currently has nearly 14,000 signatures, are mostly fans or individuals who work in the music industry. "You have to change the system, if it's not working," Carlton says. "And the way that you do that is you start from the top. I would like there to be fresh blood in there — I don't think I'm alone in that. There are nice qualities to this president, and I know he's a nice guy. However, when you want to make changes, the leader has to change." Other artists have been equally straightforward in their sentiments. On Saturday night, when Fiona Apple performed with Garbage's Shirley Manson in Los Angeles, Apple sported a T-shirt that read: "Kneel, Portnow." On Feb. 2 — after Portnow made his initial comments and his follow-up remarks — singer-songwriter India.Arie, the four-time Grammy winner who performed at this year's awards in the pre-telecast portion of the event, also published an open letter to Portnow, in which she underlined issues of intersectionality and referred to inequalities in both gender and racial representation. She wrote: "Neil Portnow is mistaken. His statements are a mess, but I get why he can't empathize with women and women of color. HE is saying, the more women there are, the more chances women have to WIN. BUT. WE NEED MORE WOMEN, more WOMEN OF COLOR AND MORE INCLUSIVE MINDED PEOPLE in positions of power, in the rooms where decisions are made. When this happens, doors will open for women to be represented in more DIVERSE WAYS. The music industry is dominated by white men and the Grammys and NARAS are run and produced by ONLY white men. The fact that Portnow says we'd 'be welcomed' indicates that he doesn't think we're part of the household to begin with." Influential women who power the business of music have also stepped forward to castigate Portnow. Over the past several days, two groups of female music industry executives wrote open letters to NARAS and to Portnow urging systemic changes to the way the Grammy Awards and the Recording Academy are structured. Last Thursday, more than 20 female industry leaders — in a group helmed by attorney Rosemary Carroll that includes Warner/Chappell vice president of publishing Katie Vinten and notable artist managers, agents and publicists such as Pharrell Williams' manager Caron Veazey — made public a letter they wrote directed to Neil Portnow. That letter, which was published by Variety, demands Portnow's resignation in pointed and angry terms. In part, it reads: "The statement you made this week about women in music needing to 'step up' was spectacularly wrong and insulting and, at its core, oblivious to the vast body of work created by and with women. Your attempt to backpedal only emphasizes your refusal to recognize us and our achievements ... We do not await your welcome into the fraternity. We do not have to sing louder, jump higher or be nicer to prove ourselves." "We step up every single day and have been doing so for a long time. The fact that you don't realize this means it's time for you to step down.'" On Monday, a group of six executives from several leading record labels — Michele Anthony, executive vice president for the Universal Music Group; Jody Gerson, chairman and CEO of Universal Music Publishing Group; Julie Greenwald, chairman and COO of Atlantic Records; Desiree Perez, COO of Roc Nation; Sylvia Rhone, president of Epic Records; and Julie Greifer Swindler, executive vice president of business affairs and general counsel for Sony Music Entertainment — wrote a letter to the Recording Academy's board of trustees. NPR has obtained this letter, which reads, in part: "We are writing to you, both on behalf of ourselves as women and on behalf of our companies, after the recent Grammy nominations, awards and telecast, as well as certain statements by your President, Neil Portnow, and the producer of the Grammys' telecast, Ken Ehrlich. Taken together, these actions once again demonstrate that NARAS remains woefully out of touch with today's music, the music business, and even more significantly, society ..."
"NARAS, which purports to represent every area of the music ecosystem (e.g., artists, producers, songwriters, engineers) should be leaders in this evolution, and yet it has shown itself to be the opposite," the letter continues. "We ask you, as a Board, to take this message from those who have devoted their lives to music seriously. Neil Portnow's comments are not a reflection of being 'inarticulate' in a single interview ... To be clear, if NARAS seeks to reflect music's diverse community then it must 'step up' and be accountable to it." A previous version of this story stated that the Recording Academy has never asked its members to provide demographic data about themselves. NARAS does collect demographic data on its membership, but does not require that members provide that information. As a result, it does not have complete data on its membership. NARAS added that it does not collect demographic information on Grammy winners or nominees.